The College celebrates its identity as a Minority Serving Institution (MSI). 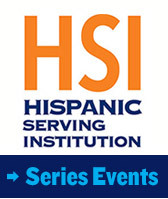 As defined by the federal Higher Education Act, MSI means that John Jay is an institution whose enrollment of underrepresented groups exceeds 50 percent of the total enrollment, At John Jay, nearly 47 percent of the student population is Hispanic, 17 percent identify as African American, 20 percent as White and 10 percent as Asian. A recent report by the Education Trust also ranked John Jay College #3 for the graduation rates of Black students among top-performing colleges and universities. John Jay is listed #10 for diversity among colleges in the entire Northeast, according to the Wall Street Journal/Times Higher Education (THE) College Rankings. John Jay offers unique student success programs including Apple Corps, PRISM, CUNY Service Corps, SEEK, the Pre-Law Institute, Ronald H. Brown Law School Prep Program, and the Honors Program. The Program for Research Initiatives in Science and Math (PRISM) aims to provide science, technology, engineering, and math (STEM) students with faculty-led research experiences throughout their undergraduate career. PRISM students attend the Annual Biomedical Research Conference for Minority Students and the Annual CSTEP Student Conference to present their work in the fields of chemistry, toxicology, cellular and molecular biology, environmental sciences, microbiology and other disciplines. The Ronald E. McNair Post-Baccalaureate Achievement Program, made possible by a grant from the U.S. Department of Education, provides workshops and mentoring to prepare low-income, first generation students, and students from underrepresented populations, for graduate school admission and eventual doctoral study. The Program boasts an over 70 percent success rate of McNair Scholars being accepted to graduate school within two years of graduating from John Jay. In addition, the Program has had several prestigious fellowship winners including National Science Foundation Fellowship winners, a Marshall Scholar, White House Fellow and a Ford Foundation Fellowship Honorable Mention. The Urban Male Initiative program provides personal, social, academic and professional support for the most underrepresented groups, specifically African American and Latino males. The Women’s Center for Gender Justice seeks to advance knowledge of gender equity and women’s issues through educational programming, counseling and activism. They collaborate with clubs and organizations at John Jay and throughout the New York City area to promote gender equity, LGBTQ rights, anti-violence education, and reproductive justice. 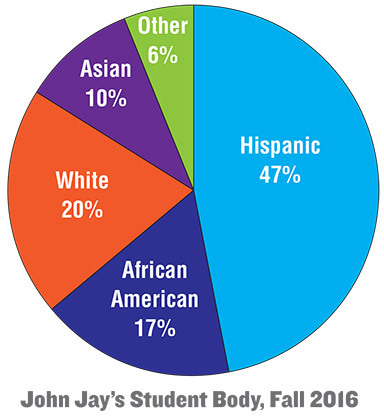 There are more than 70 student clubs and organizations at John Jay, including the Black Student Union, DESI Society, Arab Student Union, Latin American Student Organization, and the International Students Association among many others. Explore the site to learn more about academic programs, diversity facts and resources available at John Jay.